Filmmaker Davis Guggenheim reminds us that education “statistics” have names - Anthony, Francisco, Bianca, Daisy, and Emily, whose stories make up the engrossing foundation of Waiting for “Superman”. 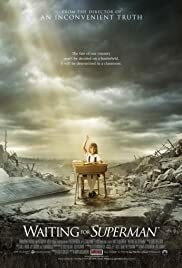 BEFORE: Going along with the major U.S. problems trend from last night’s Food, Inc., today’s documentary, Waiting for “Superman” takes a look at the fledgling education system in America. I remember this documentary met wide acclaim from both critics and moviegoers alike so I’m optimistic this will be yet another well-rounded, informative, and entertaining documentary. AFTER: One thing I’ve been learning a lot about documentaries these past couple of weeks is that it doesn’t matter how many interviews you have or what they say. What matters is who the person is and whether or not they are credible. In Waiting for “Superman” there is a wide variety of interviews ranging from students and their parents to teachers and school administrators. And these interviews paint a clear picture; something needs to be done about education in America. It’s very telling that something is wrong when you have former Superintendent’s and current heads of school districts that not only say something is wrong, but actually believe it and want to do something about it. It’s the polar opposite of the majority who also says that the system isn’t great but is then unwilling to do anything about it because that could mean loss of tenure, a decrease in pay, or that they actually have to teach something instead of reading a newspaper during class. Not all arguments have two sides to them; in some situations there is only one side. With the public education system in America, you can’t argue that everything is perfect and there’s nothing to worry about. There is a big problem that needs to be solved. But I don’t feel as if it is a completely one-sided argument. Some public schools are successful that aren’t charter or magnet schools. Yes, a lot of it is still the luck of the draw based on where you live, but there is still that small segment of success. Waiting for “Superman” does mention the rare successful public schools but doesn’t really address them. It would make this documentary much more well-rounded and interesting there was an analysis on why the successful schools are successful and how this can be used to help underperforming schools. Instead, the documentary focuses on what’s wrong with the underperforming schools and what can be done to increase learning. There is a clear bias in this documentary and there has been controversy to it’s validity. The claims made are well supported by people at all levels of education from students to administrators. Even though you might not agree with what’s said, It’s always good to at least be aware of other arguments and Waiting for “Superman” provides a good starting point for discussion.